This looks great either served on individual plates, or arranged over a large platter for guests to help themselves from. An additional sprinkling of fresh coriander or rockets leaves is a nice touch too. 1 Preheat the oven to 180˚C, gas mark 4. Leaving the stalks intact, slice through the aubergines from top to bottom at 1½cm intervals, so they look a bit like a fan (you should end up with 3-4 cuts). Lightly brush 1 tbsp oil over all the aubergines and season, making sure to get into the slits. Place on a parchment-lined roasting tray. Roast for 50 minutes, turning halfway, until just soft. For the dressing, soak the cashews in cold water. 2 Sliced the lemon quarter thinly and toss in a small roasting tray with the unpeeled garlic cloves, tomatoes, thyme and remaining 2 tbsp oil. Season and roast in the oven alongside the aubergines for another 20 minutes; set both aside to cool slightly while you make the dressing. 3 Drain the cashews and place in a small blender (ideally a high-speed one such as a Nutribullet) with the lemon juice, paprika, the peeled garlic cloves (from the tomatoes) and 75ml water. Season and whizz until smooth (add a little more water if necessary, aiming for the consistency of double cream). 4 Place an aubergine on each plate, fanning it out. Spoon over the tomatoes, lemon and their roasting juices, then spoon over the cashew dressing. 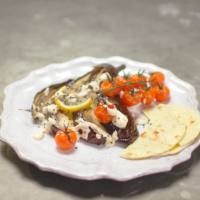 Scatter with nigella seeds, and a pinch more paprika if liked, and serve with toasted pitta or flatbreads.